A couple of weeks ago I was contacted by Sherry Lucas, the food writer for our local newspaper, who asked if I’d like to be the subject of an article. Though naturally camera-shy (as well as people-shy), I agreed, and when she suggested that I cook a dish using something seasonal, my very first thought was strawberries. Besides being pretty (I hoped the photographer would be smitten by them and forget to take any photos of me), juicy strawberries from Florida have been available in our grocery stores for the past few weeks, and we’ve been able to get Louisiana strawberries since early February from “The Strawberry Man,” a farmer from my hometown in Louisiana who drives them up every day to sell from the back of his truck. So I set to work on making the best, low-fat strawberry dessert I could, baking 4 different versions of the same recipe…and gaining 5 pounds in the process! All the experimenting paid off; the final version was light and tender. 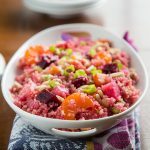 But after all that cooking, testing, and tasting, the newspaper chose to use the other recipe I made–a quinoa and asparagus dish–in the article. Never fear–the newspaper’s loss is your gain. I’ve got the recipe, as well as these photos of the cake, right here! Be warned that though fat-free, it’s no health food because of the sugar and white flour. But sometimes during strawberry season, we just have to indulge ourselves a little. I call this a "special occasion" cake because of its sugar content. 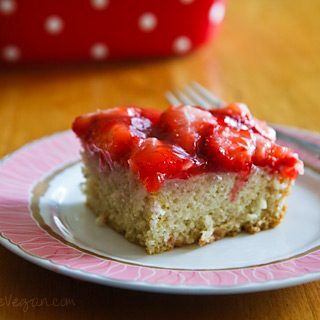 Even without the strawberry topping, it's a moist, delicious vanilla cake. Using soy yogurt makes it the most delicious, but apple sauce can be substituted in a pinch. Mix together flour, sugar, baking soda, baking powder, and salt. Add yogurt, vanilla, water, soymilk, and lemon juice. Mix until just blended–do not overmix. Pour into oiled 8×8-inch pan and bake at 350 F until a toothpick comes out clean, about 30 minutes. Remove and allow to cool completely. Combine the strawberries, cornstarch, sugar, and water in a saucepan. Cook over medium-high heat until sauce boils and thickens. Spread over top of cake. May be served warm or chilled. If you can't find unflavored non-dairy yogurt, you can use any fruit flavor and decrease the sugar by a couple of tablespoons. If you're not following a strict no-oil diet, you can use 1/4 cup yogurt and 1 1/2 tablespoons canola oil for a more tender cake; add 20 calories and 2.5 grams of fat per serving. This is really good! I had to sub a few things because my pantry is lacking at the moment but it turned out delicious anyway! I used wheat and all purp flour instead of cake flour, applesauce for the yogurt, and blueberries instead of the strawberries. I think I'm going to use your sauce creation over waffles next time I make them. Thanks for yet another great recipe! Hi Susan, thanks for the recipe, and also for the link love on Facebook! I cannot wait to try this one out. I applied the same method to blueberry with outstanding results! Is cake flour known as All purpose flour.Please explain. Cake flour has less protein and gluten than all-purpose flour, giving baked goods a lighter texture. In the US, it can be bought in grocery stores–look for boxes rather than bags. If you can’t find cake flour, you can use 3/4 cup of all-purpose mixed with 2 tablespoons of corn starch to substitute for each cup of cake flour. Hi Susan! This looks delish! Do you think it would be okay to sub the soy yogurt with something like So Delicious’ coconut milk yogurt? And rice milk (or other) instead of soy milk? I’ve developed soy issues and would still like to make this recipe as soon as strawberries make it up to NJ! 🙂 Thanks for all your fantastic recipes – you deserve the newspaper accolaes! Thanks, Christine! Feel free to use non-soy ingredients for soy. They’ll all work. This was very good! I used whole wheat pastry flour instead of the cake flour and I intended to use some stevia in place of the sugar but I forgot to add either. It was still very good!! Will make again and omit the sugar on purpose this time. You can use apple sauce or you can increase the soy milk by 1/4 cup and leave out the soy yogurt. Just wanted to say that this is a wonderful website! Made this for my dad’s birthday today and it was a big hit! So moist and delicious! Only thing I did differently was I made it in a 9×9… the baking time was more around the 20-25 minutes area for me. Hi Susan, I think u have a fantastic site, love all your dessert recipes. I would like to know if I can make the Strawberry Snack Cake with frozen strawberries & if so do I have to thaw them (in a microwave?) before making the sauce . Please advise. Thanx & keep up the good work. I would just let them thaw in the fridge overnight before using them. Hope you enjoy! Susan you should write a book, it would be great! It would be fantastic to have all your recipes together in hardcopy! Yum! I am sooo looking forward to strawberry season… it’s still pretty chilly up here in NH! 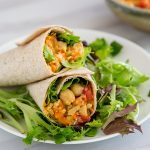 Thanks for this recipe – it was delicious! My son is on a very restricted diet to try to pin down his allergies, so we subbed GF baking mix for the pastry flour. The cake was dense, but tasty and the sweet/sour strawberry sauce was a good complement. It looked and tasted like cake, which was great! It’s a whole lot more than I can say for some “alternative” recipes I have tried lately. mmm.. delish! Just made this today – perfect for a lovely spring day! This was fabulous! I’ve been dabbling a bit with vegan baking and I’ve never made a cake that was edible. This was more than edible and I could have easily eaten the entire cake myself! Everyone loved it. I bought a ton of organic strawberries on sale this past Friday and wanted a way to use some of them, so I made this – it’s delightful! Even my husband, who is not big on sweets, liked it. His only complaint was that it tasted a little “healthy” but that was my fault for using 3/4 cup of white whole wheat flour… I just couldn’t stand the thought of all that white flour! 🙂 I think the cake is perfect, though I think next time I will decrease the sugar in the strawberry sauce since it was a tad sweet for me (maybe my strawberries were just that sweet?). I used vanilla almond milk and some homemade vegan yogurt too. Thanks for the cornstarch tip to sub for cake flour! Yum! I cannot wait for strawberry season here in upstate New York now! Just wondering where you got that ADORABLE red/white polka dot pan? Omg, omg, omg. I can’t wait to try this!! question: Would you put the topping on it right away or would you wait until serving time? i.e. does it hold up when put together? You can put it on beforehand, but put the whole thing in the refrigerator. Also, it works best if you leave the cake in the pan rather than take it out. Thanks so much Susan! I’ll do that now that the cake has cooled. We are having it as a special treat tonight. We LOVE your recipes!!!! Ok just made this……wow. thank you thank you. Had no yogurt on hand but used applesauce and a lil oil combined 4/1 to equal the amount of yogurt. This is sooo what I needed to go along with nada “chicken” parmesan over polenta. Perfect comfort food without too much guilt. I am baking this after seeing the post the other day and then pinning it to make later when I had strawberries. I was missing a couple of ingredients like soy yogurt, but I added a touch more almond milk and it made a very nice batter. We’re all excited to try this. YUM!! 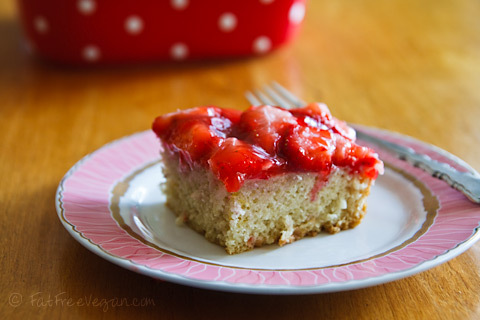 My husband was just saying to me the other day – “I wish we could find a good recipe for strawberry shortcake”…. and then this recipe pops up! I can’t wait to try it. Thank you! 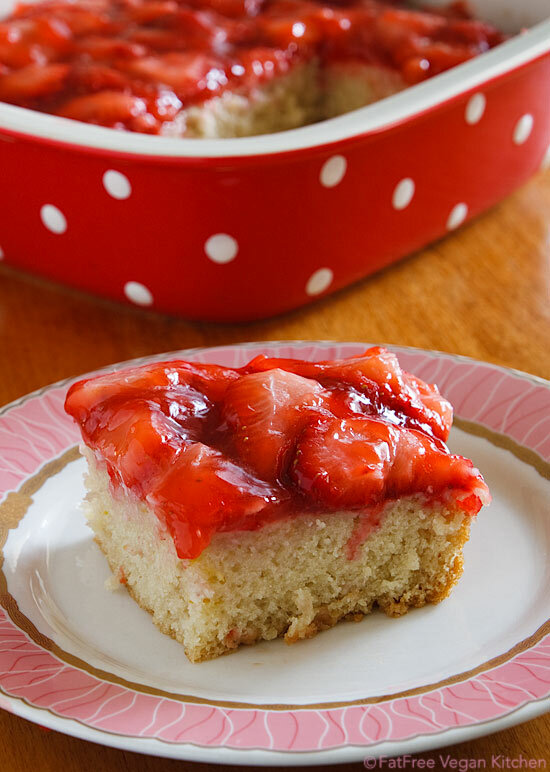 Susan this recipe looks delicious and you are so right about strawberry season – sometimes we have to indulge just a little 😉 Excited to try this cake! Thanks for the great recipe – Pinned! Hi Susan! My little one has many food allergies and I’m trying to find a vegan and gf cake to make for my birthday this weekend. I can’t find gf cake flour at Whole Foods, so I’m wondering if you have a specific gf suggestion. Should I follow your advice with the “all purpose” gf flour and mix it with corn starch, or because it has no gluten, use it as is, or should I be looking for a special baking mix?Thank you!! Oh gosh, Stacy, I am really no expert in gluten-free baking! I’m not even adequate, really. My belief, however, is that a gluten-free baking mix can be used instead of wheat flour, no extra starch required. I’m not sure about an all purpose gluten-free flour, but if you notice any starches on the ingredients list, it probably is already formulated for baking. Hope it comes out well! Thank you! I’ll try it and see!! Made the cake with Bob’s Red Mill All Purpose Baking Flour today. That seemed like the best choice at Whole Foods. It turned out great!! Thank you for the advice and the recipe! Love this snack cake. I used Truvia sweetener in place of the sugar in the recipe, and it turned out great. Definitely would recommend others to try it. AMAZING!!! 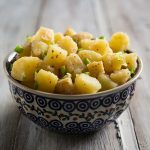 I’ve finally made this recipe – so delicious!!! Do you have something similar for blueberries? Or can I use blueberries in place of the strawberries? I’m so glad you liked it! I can’t see any reason why you couldn’t use blueberries instead of strawberries. I’d love to know how it comes out if you do. I’m not able to PIN from this site. Hoping you’ll add it to your Pinterest page so i can pin it from there. Looks amazing!!! Thanks! The Pin button is down right now, but I’ll see if I can pin it from Pinterest. Hi Jenny, by fat-free, I mean free of added oil. Whole foods plant-based diets don’t exclude foods that have naturally-occurring fat, like soy milk and yogurt. 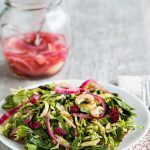 Love your fat free recipes! Thanks for doing the heavy lifting on developing these for those of us on Dr Esselstyn’s “no oil” (“I said NO OIL!”) diet. You’ve nailed it! This reminds me of my German Grandmothers cottage pudding ( cake) . Only better. She used lemon topping. also yummy. This is easy and very good , Susan! Thank you.